A new spy satellite is circling Earth after a spectacular sendoff Tuesday evening, marking the first time such a clandestine national security spacecraft has launched aboard America's modern breed of rockets. Boeing's next-generation Delta 4 rocket fired away from the infamous Space Launch Complex 6 at Vandenberg Air Force Base in California just after sunset for the 54-minute ascent into orbit. This inaugural West Coast flight of the Evolved Expendable Launch Vehicle program began at 8:33 p.m. local time (11:33 p.m. EDT; 0333 GMT). The liftoff was delayed 19 minutes due to strong winds blowing across the hilly launch base. Powered skyward by its hydrogen-fueled main engine and twin strap-on solid rocket motors, the Delta 4 created a brilliant trail visible across a wide swath. Spaceflight Now readers throughout California and even Mexico reported spotting the launch. Crews working on the secretive mission had been waiting years to see the rocket go. The booster was assembled on the pad in 2003, only to have its launch date slip repeatedly due to delays readying the payload. And liftoff plans last October were scrapped a day before launch over concerns with fuel sloshing in the upper stage. Worries about clouds and strong winds Tuesday threatened to keep the rocket grounded again. But the clouds parted and winds eased enough to let the Delta 4 fly from its renovated pad on the first countdown attempt, a remarkable achievement sure to erase lingering frustrations about the previous postponements. The rocket flew south over the Pacific Ocean, soared above the tip of South America, then crossed the extreme southern Atlantic before passing south of Africa and starting its northward trajectory over the Indian Ocean. Less than an hour after the flight began, the second stage motor released the top-secret National Reconnaissance Office payload while flying just east of Madagascar. The National Reconnaissance Office is the U.S. government agency responsible for developing and operating the country's fleet of spy satellites. The NRO keeps details about its spacecraft hush-hush, and the Delta 4 cargo was no exception to that rule. But information made public about the launch implied the satellite was headed for a highly elliptical, highly inclined orbital perch often called a Molniya-style orbit. Sky watchers around the world have made a hobby of tracking mystery spacecraft and using the Internet to trade viewing tips. Canadian Ted Molczan, a respected satellite observer, says past experience could indicate the possible use for the craft launched by the Delta 4. "I estimate that this rocket configuration can place in excess of 4,000 kg into a Molniya orbit. The U.S. has used such orbits since the early 1970s for communications and SIGINT (signals intelligence) satellites," Molczan said. Tuesday's flight was the 14th for an EELV rocket since 2002. But all previous launches had occurred from Cape Canaveral, Florida, and none had carried a National Reconnaissance Office spy satellite. The EELV program was created a decade ago by the Air Force to spark the creation of cheaper, less cumbersome U.S. rockets to haul satellites into space, replacing older designs like the Titan 4. Boeing's Delta 4 and Lockheed Martin's Atlas 5 rocket families were born to answer the military's call. Both companies have launched various versions of the rockets with commercial, NASA and Air Force satellite payloads from complexes on the East Coast. And they have built launch pads on the West Coast at Space Launch Complex 6 for Delta 4 and SLC-3 East for Atlas 5. Now, Vandenberg has witnessed its maiden EELV blastoff at last. "Assured access to space is vital to our country. Bringing EELV to the West Coast is a next step," Lt. Col. David Goldstein, the Air Force launch director and commander of the 4th Space Launch Squadron, said in an interview. "I see it's a major step for our country ... because we have to have that access from both coasts because of the types of orbits that are used." The Vandenberg launch site allows rockets to fly southward for delivery of spacecraft into orbit around Earth's poles for coverage over most of the planet's surface. Cape Canaveral is best suited for launches headed eastward to reach equatorial orbits. "Over the next couple years we're going to have a few Atlas launches and a few more Delta launches, and they're all vital to our national security. In my mind, it's a huge step forward to be able to get EELV launched off of the West Coast," Goldstein said. "This first Delta 4 launch from Vandenberg is an important achievement for Boeing and our NRO and Air Force customers," said Dan Collins, vice president of Boeing Launch Systems. "Today we successfully validated launching the Delta 4 from SLC-6, providing the Air Force and the nation with the first operational West Coast launch site for the EELV program. "With this launch, the Delta team has fulfilled all the EELV requirements outlined by the Air Force. We have a full family of launch vehicles, including a flight-proven, heavy-lift vehicle, a domestically produced first stage engine and now fully operational launch sites on both coasts." 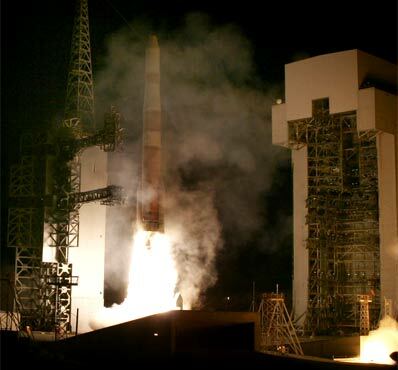 Plans call for a second Delta 4 launch from Vandenberg in November to deliver the Defense Meteorological Satellite Program's DMSP-17 weather satellite into polar orbit. The first West Coast Atlas 5 is stacked on its pad for liftoff in January carrying a classified NRO payload. Lockheed Martin has retrofitted its existing Atlas pad to accommodate the larger, more powerful Atlas 5. However, the California home of Delta 4, commonly called Slick Six, has a unique history. The site's star-crossed legacy began with construction in the 1960s for the Air Force's Manned Orbiting Laboratory space station project. But that program was cancelled before the first launch. Then came visions of military space shuttle launches to polar orbit. Billions of dollars were spent rebuilding the pad in the 1980s for liftoffs of the winged spaceplane. The Challenger accident and the Pentagon's transfer of its satellites from the shuttle to unmanned rockets put Slick Six back into mothball status before hosting a single launch. Lockheed Martin's tiny Athena booster made four flights from the pad in the 1990s, yet only one enjoyed full mission success for both the rocket and satellite. The new era of Delta 4 started with pad modification work in 2000. Now, there's a successful launch to celebrate.